Depending upon the thought, Michael Bennett and Chris Long can either finish each other's sentences or have the opposite opinion. The Eagles defensive ends, teammates for only five months, have become fast friends. They're comfortable with the expression "bromance," although some of their teammates prefer the euphemism "frenemies." "Yeah, it's a bromance," Long said recently. "But you need bromances on a team. We're going to play next to each other hopefully. We're going to be out on the field a lot together, so we need to communicate. We have to know each other off the field." The NFL, with hours of down time between practice and games, affords players and coaches the opportunity to forge relationships. Bennett and Long — veterans, thinkers, firebrands – developed an instant connection because of their many similarities. And despite their few outward differences. "I get a chance to have deep conversations," Bennett said. "After a while, being in the NFL so long … "
"You don't want to talk about football anymore," Long interrupted from the neighboring locker stall. The locker room at the NovaCare Complex is divided by position, but situating Bennett next to Long – not long after the Eagles acquired the former Seahawk in March — was likely intentional. Bennett had written of his admiration for Long in his book, and Long said he had a similar impression of Bennett having followed his career from afar. But the team probably didn't envision a scenario in which the pair would become the Eagles' version of Mutt and Jeff. In the locker room, they're a two-man act, playing off one another. On the field, they stretch together, motivate each other and break the monotony with observational comedy. The conversations take a tonal shift, however, during late night gabfests in the team hotel, or more frequently in the defensive line meetings. For 45 minutes or so, the players will watch film and go over X's and O's. And then assistant coach Chris Wilson will push pause and give Bennett the floor. "We call it the Farrakhan five minutes," defensive end Steven Means said, referring to Louis, the Nation of Islam leader. "It's Mike's time to get in a little wise words. Chris will jump in just to play the devil's advocate. "It could be Mike saying, 'Man, this hat right here, this is a nice hat.' And Chris'll be like, 'Why is it a nice hat? Because you wore it and I didn't wear it?'" In truth, Bennett and Long agree on most subjects. They're political progressives, social activitists and philanthropists. They're also outspoken and frequent targets for those who don't share their ideology — especially Bennett. But when there's verbal jousting they're often contrarians. "We compare, we debate, we challenge each other on things that we believe intellectually," Bennett said. "It motivates us. It stimulates our mind not to just be stuck in one place all the time." Or they just like to bust each other's chops. "I can really irritate him on purpose and send him to the edge," Long said. "I just know what his buttons are, what issues bother him." Behind the needling, they said, is genuine respect. Bennett and Long, during a joint interview, listed the ability to balance football with having empathy for others as characteristics they admire most in each other. They are at stages in their careers where they have little left to prove and have increasingly figured out that there's more to life than sacking quarterbacks. And they share. Long recently borrowed Bennett's copy of Good and Evil by Martin Buber. Bennett is waiting for Long to lend him Sapiens by Yuval Noah Harari. On Tuesday after practice, Long gave Bennett the keys to his Toyota FJ Cruiser. They've been brought together because of football, but they also relate as husbands and fathers. "I know for a fact, Chris being in the league as long as I have, he's experienced a lot of the same things, whether it's with his family, whether it's with marriage, whether it's with children," Bennett said. "I think in football you got to find people you can depend on, that you can talk to when you're going through certain things. And I think that's how you build camaraderie." 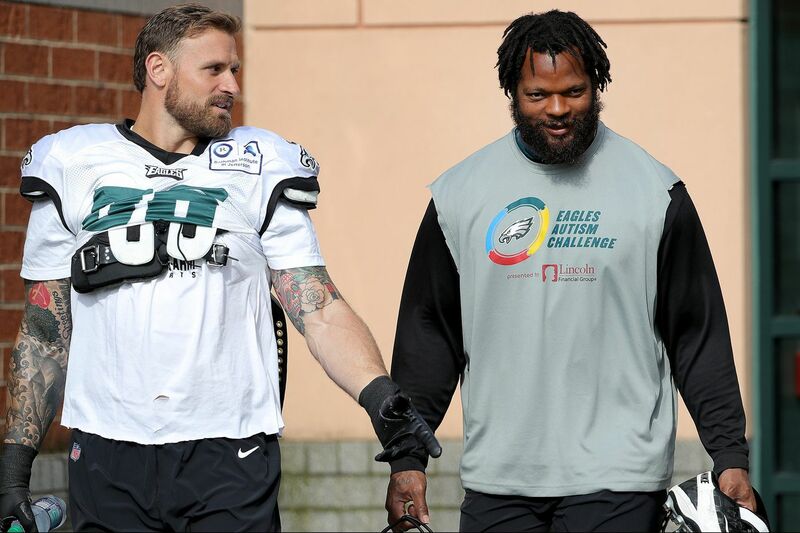 Eagles defensive linemen (L-R): Michael Bennett, Chris Long and Fletcher Cox during practice at Lincoln Financial Field in South Philadelphia on Sunday. On the field, they have each other's backs. When Bennett tackled running back Corey Clement in the backfield recently during training camp, Long ran out onto the field just to give his teammate a high five. And when Bennett tussled with tight end Richard Rodgers, Long was the first defensive lineman to offer support. The Eagles privately had some concern over how Bennett would assimilate. The Seahawks cited him as a locker room leader, but he was a large personality about to join a Super Bowl-winning team with an established culture. Bennett hasn't exactly hidden in his stall, but his presence alone attracts attention. He can also conduct from his perch, with Long often by his side. A recent mix-up in the flavor of water ice brought to Long by a young defensive end – "Where's the Mango, bro? "– had Bennett clapping his hands and calling for service – "Rookies?" But he's an equal-opportunity agitator. "I talk [stuff] all day to everybody – Jeffrey Lurie, what's the head coach's name? Doug Pederson?" Bennett said while wearing a red "Immigrants Make America Great" hat. "Everybody." Bennett is a provocateur. He isn't politically correct. "[Forget] PC," he said. "We [freaking] cuss." "He teeters near the line a lot," Means said. "So he'll get on the line and then right before he crosses, he'll step back. And then before you know it, he's right back on the line again. And then he steps off. "He don't really push it to where people get mad. But he'll spark something up in the meeting and everybody will go, 'What?'" Bennett will dabble in conspiracy theory if just to shock – with Long often the intended mark. Topics run the gamut, but he often focuses on current events. In the D-line meeting room, everyone is free to engage, and Wilson will even debate. "And coach know a lot," defensive end Brandon Graham said. "Coach will start hitting him with facts. And then the next day, Bennett will be, 'Yeah, coach knows what he was talking about.'" The discussion can sometimes center on real-life issues with Bennett and Long sharing personal details. For second-year defensive tackle Elijah Qualls, conversations about manhood have been the most beneficial. But with Bennett the talks tend to funnel back to the same conclusion. "That Mike feels white people run the world," Qualls said. "But Mike's only half serious about it. He definitely has some beliefs about systems. But at the same time, it's not like he's sitting there blaming white people for everything. Michael Bennett and Chris Long (left) have always respected each other from afar. "But he likes arguing that. And while Chris Long would definitely agree with some of it, he's very practical." Bennett, of course, wrote the book, Things That Make White People Uncomfortable. And yet, Long, who is white, is his best friend on the Eagles. Bennett says their relationship transcends race – as many do in football – but players of similar skin tones still predominantly sit together in NFL cafeterias. "That might be true," Long said. "That's very true," Bennett said. "But the D-line's different. We have to mesh." Bennett and Long, at least, are intertwined. They may argue, but their bond has been cemented on and off the gridiron. "He told me today he appreciated me," Long said, "and I thought he got hit in the head." Long, listing Bennett's virtues, returned the praise. "I'm like, 'How could people not like him?'" he said. "People like me," Bennett shot back. "No, people don't like you," Long said. "There's a lot of people that like me," Bennett said.